Merk Insights - Has the Dollar Lost its Safe haven status? Has the Dollar Lost its Safe Haven Status? Treasuries are rising (bond yields falling) when there’s a “flight” into Treasuries. The dollar index is rising when the dollar is rising versus a basket of currencies. 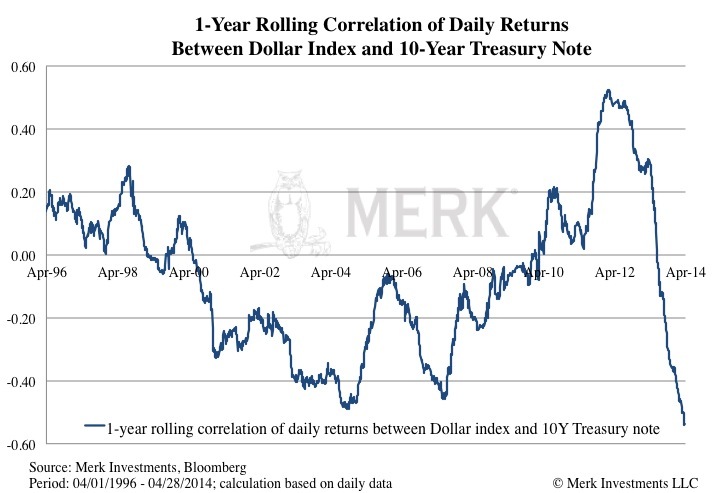 A positive correlation suggests that Treasuries and the dollar move in the same direction. On the days when Treasuries are risings the dollar index will rise as well. Similarly when Treasuries are falling the dollar index declines. In other words, when there’s a “flight” into Treasuries on a typical risk-off day, it’s associated with a flight into the greenback, out of foreign assets. A negative correlation suggests that Treasuries and the dollar move in the opposite direction. On days when Treasuries are risings the dollar index is falling, and when Treasuries are falling the dollar index is rising. In other words, when there’s a “flight” to safety (Treasuries are rising), it’s associated with a flight OUT OF the greenback. This could happen when domestic investors flock to the greenback, but foreigners prefer other assets. The dollar “always” benefiting in times of crises – or at least when such crises are expressed in terms of U.S. Treasuries benefiting – is a myth. The myth of a “risk off” trade benefiting the U.S. dollar was reinforced in the aftermath of the financial crisis. The mundane: we are measuring 1 year rolling correlation. Some event caused the correlation to surge; conversely, of late, that event is no longer part of the data set. The non-crisis crisis: Treasuries haven’t been all that volatile of late. Striking, still, is that rather than moving towards a correlation of near zero (showing that there is no correlation), the correlation has plunged deeply into negative territory. It’s possible that the greenback only benefits during a “real” crisis. Possibly in “subtle” crises, the greenback is not favored by investors. The real deal: the dollar index has a 56% euro weighting. It was in the summer of 2012 that Mario Draghi, the head of the European Central Bank, announced he would do “whatever it takes” to save the Eurozone. At the time we published an analysis entitled “Draghi’s Genius” discussing what we said would be a turning point in the Eurozone debt crisis. And boy it has. The little flare-up in the chart above in early 2013, by the way, is the crisis in Cyprus. Despite some jitters in the markets (that’s the flare-up in the chart), there was no longer the so-called “contagion” as risk was priced locally (please click here for a full analysis published at the time entitled “Chaos Investing Unplugged”). The chart above suggests the euro has become a true competitor to the greenback; at least for now. It’s possible that this reversal of fortune for the greenback is temporary. It may also be the proverbial canary in a coalmine; that you can’t rely on the greenback any longer as the one “safe” place. Indeed, we have long argued that there may not be such a thing anymore as a safe asset and investors may want to take a diversified approach to something as mundane as cash. This chart appears to support this notion. Next time, we dive into more detail as to how currency risk affects your international investments. Make sure you have signed up for our newsletter so you never miss a Merk Insight again. If you find value in our analyses please encourage your friends to sign up for this free newsletter, have them follow me on twitter, and/or post a link to this newsletter on your favorite social media site. 1. The ICE U.S. Dollar Index® (USDX) is a trade-weighted geometric average of the U.S. dollar’s value compared to a basket of six major global currencies (euro, Japanese yen, British pound, Canadian dollar, Swedish krona, Swiss franc) set by the ICE (IntercontinentalExchange) Futures US. 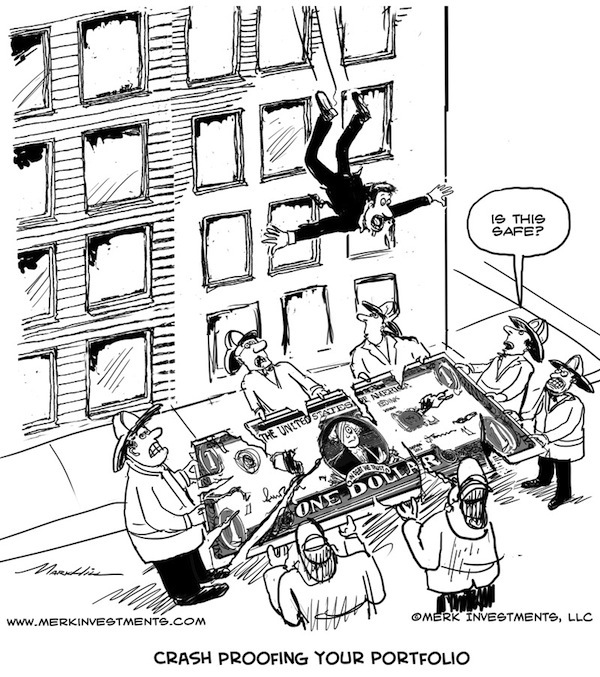 It is not possible to invest directly in an index.